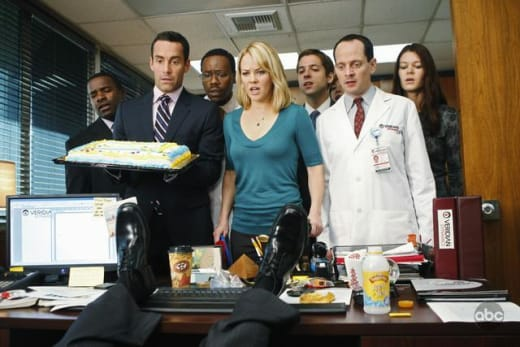 Better Off Ted Review: "Beating a Dead Workforce"
As ABC continues to rush through its Better Off Ted episodes, we continue to love them more each week. 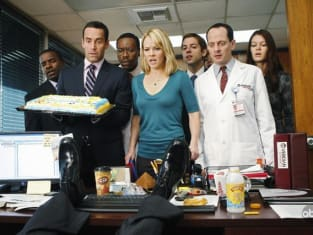 The first of two new episodes last night, "Beating a Dead Workforce," was again remiscent of the stronger season one, sans Veridian commercial. The show continues to show its strength when it tackles workforce situations in the ridiculous manner only the fictional Veridian could. In this week's installment, Veronica showed just how manipulative she could be when an employee died. While a normal company would encourage mourning during its funeral for an employee that passed away, Veronica gives the troops an inspirational speech and tries to gets her troops to work even harder. As a result, Jenkins become almost a Jesus-like character and had a cult of drones following him. Overall, we loved the episode and would easily give it an A rating. The main storyline was brilliant and quirky in standard Ted fashion. As for the subplots, Lem's storyline was strong, but slightly dragged on, while Linda's "seize the day" plotline had a few decent jokes, but felt weak overall. More importantly, does anyone know how we can get a full copy of "Veronica in the Key of Love?" Now for some of our favorite Better Off Ted quotes from the episode after the jump. Lem: We did it, Ted. We now have a working prototype for the Veridian Sleep System. Lem: Gordon Jenkins was a good man. But he was also a complex man. For example, he liked coffee, but he did not like having coffee thrown at him. In fact, Jenkins hated being burned by any hot liquid. In that way, he was like many of us, sensitive to heat. What a character. Goodbye, Jenkins. I hope you're throwing coffee at God right now. Veronica: Nice work, Lem. Goosebumps. Ted: Morale does seem pretty low. Linda: It's like that time they paid our holiday bonuses in frozen food. Ted: Potpie Christmas. It did not help that they made them with real reindeer. Phil: All the hard work, late nights and no rest have paid off. We've cured sleeplessness and demonstrated irony.